Homemade nacho sauce. I didn't have nacho sauce on hand so I cubed up some velveeta, about a cup, and threw it in a pan on the stovetop. I added about a tablespoon of milk and a few glugs of hot sauce and stirred until melted. You can always use regular shredded cheese if you prefer. Corn tortillas vs. tortilla chips. I tried it both ways. The corn tortillas are a bit more fussy as they require baking in the oven, but they produced a prettier crunchwrap. When I tried using tortilla chips, the edges of the chips are sharp edges and they tore up the flour tortillas pretty badly, even though I was trying to be very careful not to do so. 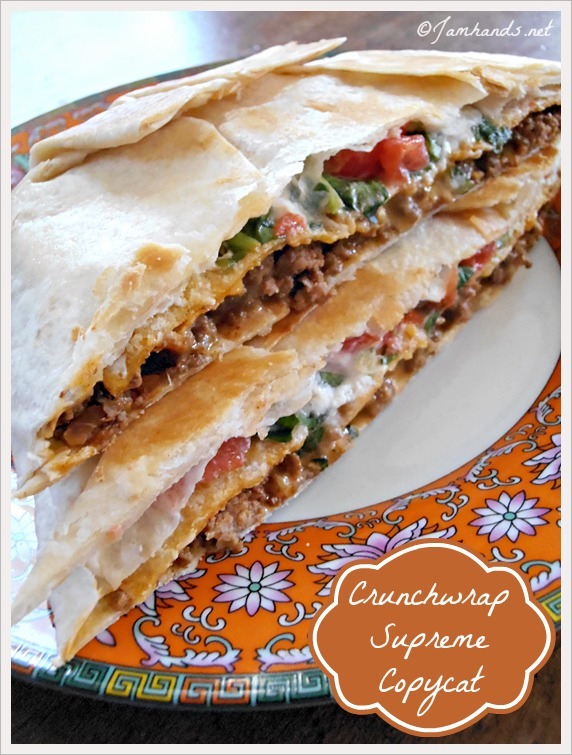 Be sure to warm each flour tortilla in the microwave for a few seconds as you start to make each new wrap. It makes them easier to work with and there is less of a tendency to tear. Brown ground beef in a skillet, then add taco seasoning (according to package directions). Set aside. Bake the corn tortillas in the oven at 400 degrees for a couple of minutes, until they are golden and crunchy. Microwave the flour tortillas, one at a time (because they cool off quickly), for about 10 seconds to warm them up; this will make wrapping easier. You could also warm them up in the oven; just wrap them in aluminum foil and heat them up for about 10 minutes at 350 degrees. Lay out the flour tortilla. 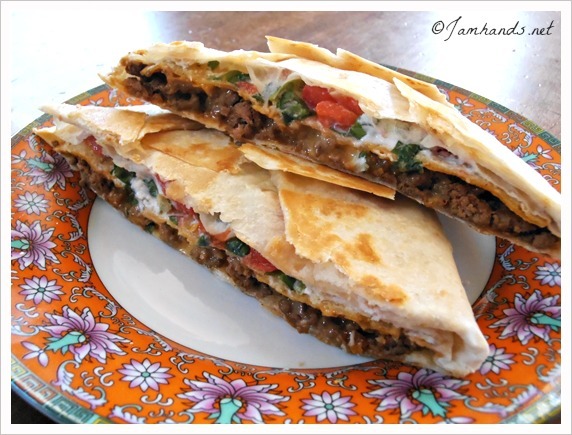 Spoon some of the seasoned beef into the center of the tortilla. Top with some nacho cheese, or shredded cheese. 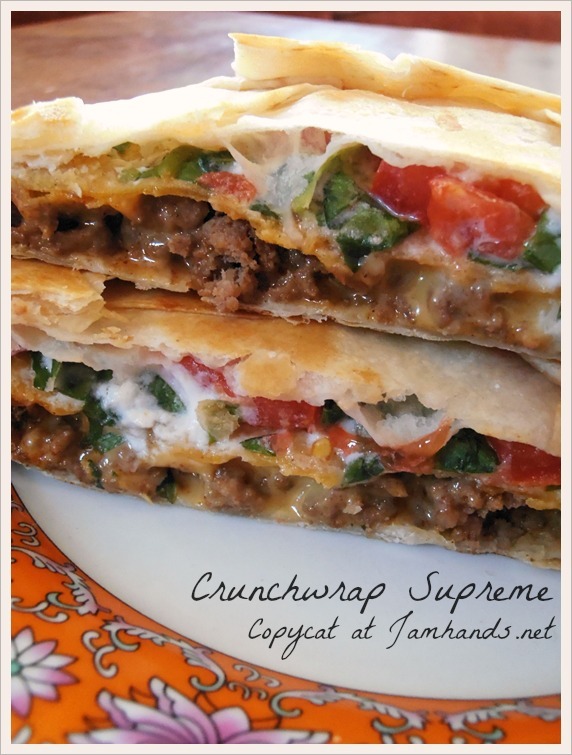 Place the crunchy corn tortilla on top of the cheese/beef; spread a dollop of sour cream on top of it, then toss on some diced tomatoes and shredded lettuce. Starting with the bottom of the tortilla, fold the edge up to the center. Continue doing this in a clockwise or counter-clockwise movement until all of the tortilla is folded over, and the filling is entirely enclosed. If your filling isn't entirely enclosed and you have an open spot, simply cut out a circle from another flour tortilla and place it on the exposed area, then wrap the tortilla again. Spray a frying pan with cooking spray. Carefully place the Crunchwrap, seam-side down, in the pan. Press with a spatula and cook on medium-low heat, for about 3 minutes, until the bottom is nice and brown. Flip it over and cook until it is golden brown. This looks delicious. I might use tostadas which are basically pre-crisped corn tortillas. I also like to cover my flour tortillas with a wet paper towel when I micro them. It creates steam so they get extra soft! Ali, I checked out the link.....yours looks just the tiniest bit BETTER...though both look yummy. Great job! I did the same thing as "Unkown" I used tostadas which worked pefectly and I also use a damp paretowel on the tortillas while microwaving them. I usually put them in for 15-20 sec. Also I found that if i use sour cream inside of the crunchwrap, it curdles quite a bit when crisped in the frying pan. I usually make these minus the sour cream and serve it on the side. Yummy! This is making me hungry.